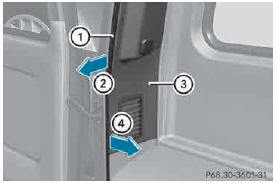 The actuator is located in the cargo compartment, on the left-hand side behind the rear wall trim. 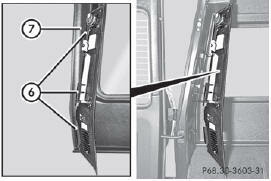 ► Pull off edge protection 1 from the door pillar in the direction of arrow 2. 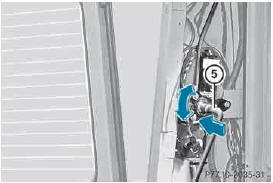 ► Pull away rear panel trim 3 as far as necessary in the direction of arrow 4 until the electrical connections can be accessed. ► Disconnect the electrical connections. ► Remove rear panel trim 3 completely. ► Take lug wrench 5 out of the vehicle tool kit . ► Place lug wrench 5 onto the hexagonal nut of the actuator. ► To open: turn lug wrench 5 counterclockwise. ► To close: turn lug wrench 5 clockwise. ► Reconnect the electrical connections. ► Re-install rear panel trim 3. When doing so, hook lugs 6 of rear panel trim 3 into vehicle side wall 7. ► Re-install edge protection 1. ► Close the rear door.